It’s been a long time coming since the Patriots beat the Golden Falcons. They suffered another loss to their sectional rival. 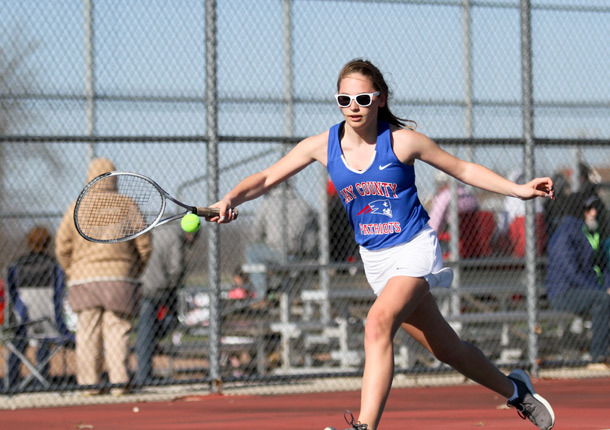 Jay County High School’s girls tennis team dropped its home opener 5-0 to the Winchester Golden Falcons on Monday. Jay County, which had won the sectional tournament it hosts from 2013-15, it has lost to Winchester in the final each of the last three seasons. Without a varsity player returning from last year, the Patriots’ inexperience just didn’t match up with the defending champs on Monday. At No. 2 doubles, Ella Roessner and Ashlyn May put up the biggest fight. They took the opening set against Kaylan McIntire and Morgan Williams to a tiebreaker, but eventually lost it 8-6 to drop the set 7-6. The Winchester duo controlled the second set as well, but not without Roessner and May keeping it close. The Golden Falcon tandem nabbed the second set 6-4 for the match win. “They played really tough,” Cramer said of his pair. After losing the first set of her No. singles match to Kate Henderson, Jay County sophomore Maria Dirksen did not go down easily. She hung with Henderson until the end, eventually falling 7-5. Winchester’s Mariah Roberts, the team’s top singles player, only gave up two games in her win over Jay County senior Dawn Minnick. Roberts used a steady mix of strong forehands, soft lobs and cutting backhands to get Minnick out of position at times. Roberts capitalized on hitting mistakes, too. While the score suggests otherwise, Lyric Garringer challenged often in her No. 3 single match with Kate Riggin. The Patriot sophomore didn’t give up points easily, but a few too many unforced errors hampered her ability to stay close with Riggin in a 6-2, 6-3 setback. Seniors Jenae Kirby and Teresa Romero dropped their No. 1 doubles match to Riley Helms and Maci Frantz 6-3, 6-2. Despite its three straight losses, Cramer is hopeful his team will continue to get better as the season goes on and they get more experience. “Just keep working harder,” he said. “The fundamentals — I’ve got them hitting the ball just like they should. They pound the ball. They get into a match the just take half swings.